Judge Alberto Julio Banos ordered the “immediate detention” for singer Justin Bieber for the 2013 attack on photographer’ in Argentina. The singer is accused of failing to respond to a court summons. Justin Bieber is accused of sending his bodyguards to attack photographer Diego Pesoa outside a Buenos Aires nightclub. Under Argentine law, Bieber would face from one month to six years in prison if convicted on a charge of causing injuries. I think its fair to say that The Biebs wont be visiting Argentina any time soon. An Argentine judge has issued an arrest warrant for Justin Bieber on Friday, saying the singer failed to respond to summons related to allegations he ordered bodyguards to attack a photographer in 2013. An email sent to a Bieber representative was not immediately returned. Bieber is accused of sending the bodyguards to attack photographer Diego Pesoa outside a Buenos Aires nightclub. Bieber never returned to Argentina to respond to questions about the incident. Under Argentine law, Bieber would face from one month to six years in prison if convicted on a charge of causing injuries. Now if only we could get a judge in the United States to do the same. 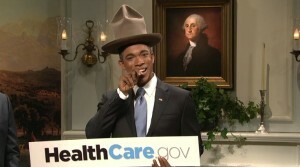 SNL mocks Barack Obama for his over the top, excessive selling of Obamacare. But then again, hasn’t Obama made a complete mockery of the presidency? In the final 48 hours before the deadline to sign up for healthcare, Obama’s aides forced him to be photographed in Pharrell’s hat and alongside Kim Kardashian and Harry Styles. And “a cat dressed as Elsa from Frozen.” And BatKid. And the Pope.